Los Angeles • Shortly after LAFC revealed its black-and-dark-gold colors and eye-catching new crest in a gala ceremony, Will Ferrell carried a director&apos;s chair onstage and sat down between co-owner Peter Guber and Mayor Eric Garcetti. "I want in," LAFC&apos;s 25th and newest co-owner declared. This is a common sentiment in downtown Los Angeles, where the Major League Soccer expansion club is already attracting plenty of attention more than two years before anybody officially kicks a ball. LAFC unveiled its colors and crest Thursday at Union Station amid cheering and singing from several dozen fans of a team that has no players or stadium yet. The club will join MLS for the 2018 season, but it already has an identity built around those colors and a logo featuring a wing incorporated into an Art Deco-inspired "LA" monogram. 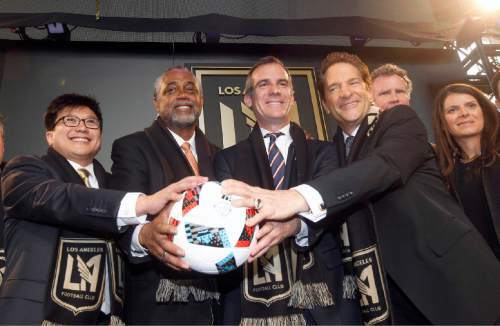 "Our promise is to unite the world&apos;s city with the world&apos;s game," LAFC President Tom Penn said. 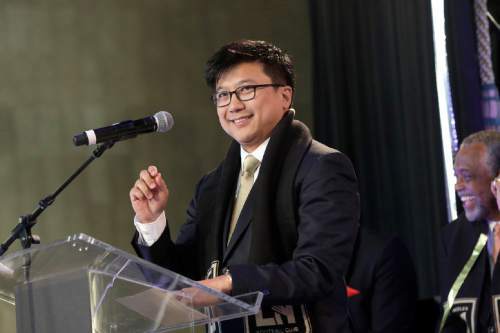 LAFC managing partner Henry Nguyen said the colors and crest are a major part of the club&apos;s aspiration to create an internationally known brand. While black has been part of LAFC&apos;s identity from the start, the club&apos;s shade of dark gold appears to be unique in the league, and LAFC also plans to incorporate red as an accent to its schemes and uniforms. "The wing is such a special symbol of what this city is, in terms of meaning, flight, dynamism," Nguyen said. "This is the City of Angels. And it&apos;s every type of wing. It&apos;s an Aztec eagle wing. It&apos;s a dragon wing. It&apos;s an angel wing. It&apos;s whatever wing you want it to be." 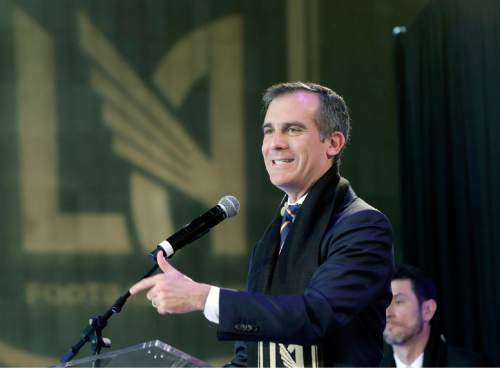 Garcetti, who envisions Los Angeles as "the sports capital of the world" while it competes for the 2024 Olympics, heralded the next step in the evolution of LAFC, which was formally granted MLS entry 15 months ago. The club is building Los Angeles&apos; first open-air stadium since 1962, playing a part in the Olympic bid and adding even more energy to the city&apos;s revitalized downtown. "We&apos;re not going to wait for any other league to make a decision, because football is here today," Garcetti said, jokingly referring to the NFL&apos;s protracted decision about returning to the nation&apos;s second-largest media market. Penn said LAFC&apos;s branding work began even before its stadium situation was finalized. "Once we solidified that we were in the heart of Los Angeles legitimately, with our brick and mortar, we wanted to build around the moniker of L.A., because it&apos;s globally recognized," Penn said. "It&apos;s very aspirational. What you learn when you talk to people overseas, L.A. is just an aspirational place to be." While the branding is a major part of the LAFC endeavor, other aspects are also surging forward for the deep-pocketed ownership group that includes Magic Johnson, Nomar Garciaparra and Mia Hamm, backed by Malaysian moguls Vincent Tan and Ruben Gnanalingam. Nguyen revealed the club expects to begin demolition of the Los Angeles Sports Arena shortly after getting full entitlements in May. LAFC will build its $250 million stadium on the site next-door to the historic Coliseum. John Thorrington, LAFC&apos;s newly hired executive vice president of soccer operations, also expects to make an announcement soon unveiling the club&apos;s academy plans. The franchise will ramp up its technical preparations shortly after the first shovels hit the ground. Until then, LAFC will use its image and merchandise to keep Southern California in anticipation. The star power of its ownership group won&apos;t hurt, either. Ferrell, a longtime soccer aficionado who starred in the not-quite-a-classic soccer comedy "Kicking and Screaming," joined the ownership group because his children play soccer with another LAFC co-owner&apos;s kids. "I&apos;ve never been a part-owner of anything," Ferrell said before correcting himself: "I&apos;m still part-owner of an &apos;84 Toyota Camry with my brother." Sporting Kansas City and Houston have had a fierce rivalry over the years, and right in the middle of it has been Brad Davis, the Dynamo midfielder that opposing fans loved to hate. How quickly that hate can turn to love. Sporting KC acquired the 34-year-old Davis from the Dynamo on Thursday for a second-round pick in 2017, a third-round pick the following year and future considerations  and immediately he experienced an outpouring of support from his new fans on social media. "I think that part is great," Davis said on a conference call with reporters. "Fans make the game. They&apos;re the ones that are passionate about it. They love to hate me because we&apos;ve had some great games and I&apos;ve been in the middle of victories for the Dynamo, and we&apos;ve gone back and forth. "But I think it&apos;s a fantastic fan base," he added. "It&apos;s part of it." The six-time All-Star has scored 58 goals and notched 131 assists over a 14-year MLS career, which includes MLS Cup championships in 2006 and 2007. Davis has made 368 appearances and totaled 122 assists in the regular season, both third-most in league history. Now, he joins switches sides in a rivalry that has been boiling for the past five years. It began when Houston eliminated Sporting KC from the playoff race in the Eastern Conference title game at Sporting Park. A year later, the Dynamo knocked the club out in the semifinal round on their way to a second straight MLS Cup appearance. Two years ago, Sporting KC snapped the Dynamo&apos;s 36-game home unbeaten streak. Later in the year, the club beat the Dynamo for the Eastern Conference title on their way to an MLS Cup championship. "We both had teams that were bred to compete and fight and do whatever it took to win," Davis said, "and that&apos;s what I see in Sporting KC, that&apos;s the way I feel I&apos;ve been molded over the past 10 years in Houston. I see myself going in there, fitting in and just working hard to earn the respect of my teammates and do whatever I can to contribute to the team." Still, Davis acknowledged it is hard leaving Houston after 10 seasons. The native of suburban St. Louis is the franchise&apos;s career leader in regular-season games played (271), starts (252) and assists (104), and helped the club to seven playoff appearances. He&apos;s also played in four editions of the CONCACAF Champions League. "Brad&apos;s competitiveness, experience and leadership have always stood out and we look forward to him bringing these traits to Kansas City," manager Peter Vermes said. "This is another move that not only bolsters our roster, but will also bring a different dynamic once preseason starts."